After a tumultuous year where the #MeToo movement brought issues of sexual harassment into the spotlight, we expect consumers to have heightened awareness of the way women are portrayed in advertising on the most-watched broadcast of the year. 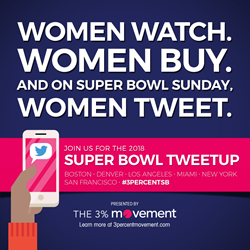 The 3% Movement and The Representation Project will co-host the 5th annual Super Bowl Tweetup on Sunday, Feb. 4, 2018. The Super Bowl is also a championship game for the advertising industry, as it marks the largest spending day of the year. For five years, The 3% Movement and The Representation Project have been critiquing the depiction of women in ads that run during the Super Bowl game, which attracts more than 100+ million viewers globally, nearly half of which are women. Hashtags for the annual Tweetup have generated more than 59+ million impressions on game day alone, and the expectation is that even more participants will weigh in this year. The following hashtags will be utilized during the game: #3PercentSB, #NotBuyingIt, and #MediaWeLike, which participants use to share which ads speak to them and are creatively inspired, effective and appealing to women. The 3% Movement is changing the narrative around marketing to women and increasing the number of female creative directors in ad agencies and brands. In 2012, the number of female creative directors was at 3%, and last fall the 3% Movement released new stats showing the number of female creative directors within 36 agencies measured has climbed to 29%. The goal is to reach 50% and have creative industries reflect the greater society and population, plus recognize that women have disproportionately high influence on consumer purchase decisions. The Representation Project uses film and media as catalysts for cultural transformation, inspiring individuals and communities to challenge and overcome limiting stereotypes so that everyone – regardless of gender, race, class, age, religion, sexual orientation, ability, or circumstance – can fulfill their human potential. The Representation Project launched #NotBuyingIt and #MediaWeLike in 2013 to inspire people to join together in celebrating good representations and calling out the bad, everywhere from advertising to merchandising. Participants will include creative directors and advertising industry professionals from across the U.S., as well as consumers and Super Bowl viewers. Live In-Person Tweetups at Agency Partners Across the U.S. In addition to tweeting from virtual participants worldwide, there will be in-person 3% events hosted at ad agencies in the following cities, run by 3% team members. Viewers can download The Super Bowl Tweetup Scorecard, which includes Twitter handles for most brands and agencies producing work that airs during the Super Bowl. This allows Tweetup participants to call advertising touchdowns for brands scoring well with #MediaWeLike, and fumbles for those in need of improvement, with #NotBuyingIt. Started as a passion project to spotlight a huge business opportunity in advertising -- the lack of female creative leadership and its impact on connecting with an overwhelmingly female marketplace -- the 3% Conference has grown exponentially since its 2012 launch and has hosted 23 sold-out events in cities globally. For additional information about the 3% Movement please visit: http://3percentmovement.com. Kat Gordon has been called the “triple threat” of an entrepreneur, ad woman + marketing to women expert and was named one of "30 Most Creative Women in Advertising" by Business Insider in 2016 and one of “Forty Over 40” women disrupting the world in 2014. Using film and media as catalysts for cultural transformation, The Representation Project inspires individuals and communities to challenge and overcome limiting stereotypes so that everyone, regardless of gender, race, class, age, sexual orientation, ability, religion, or circumstance, can fulfill their human potential. Jennifer Siebel Newsom founded The Representation Project (a 501c3) in 2011 in response to the overwhelming public demand for ongoing education and social action in support of her first film, Miss Representation. Since then, The Representation Project has released Newsom’s second directorial film, The Mask You Live In, and become well known for creating popular campaigns such as #NotBuyingIt, #RepresentHer, and #AskHerMore. Learn more at: http://therepresentationproject.org. Jennifer Siebel Newsom is a filmmaker, CEO, advocate, and thought leader. After graduating with honors from Stanford University and Stanford’s Graduate School of Business, she wrote, directed, and produced the 2011 award-winning documentary Miss Representation. As a result of Miss Representation’s powerful impact, she launched The Representation Project, a nonprofit organization that uses film and media as a catalyst for cultural transformation. Her second film as a director, The Mask You Live In, had its world premiere at the 2015 Sundance Film Festival and explores how America’s narrow definition of masculinity is harming boys, men, and society at large. She also executive produced the Emmy Award-Winning and Academy Award-Nominated documentary The Invisible War, and is an executive producer on the Emmy Award winning documentary The Hunting Ground. She is currently in production on her third film, tentatively titled, The Great American Lie. She has also served as a Global Advisory Board member of the Dove Self Esteem Project, a co-chair of We Day California, and a commissioner on the Girl Scouts’ Healthy Media Commission, and currently serves on the Common Sense Media Gender Initiative Advisory Council and the Advisory Council for the Imagine Kids Bus Project. She resides in the San Francisco Bay Area with her husband, California Lieutenant Governor Gavin Newsom, and their four young children.